No matter how happy and healthy the relationship with your dog, you can be sure that bath time will create drama. Most dogs fear and loathe the tub for a variety of reasons, and it can become a real hardship to keep them clean. Thankfully, you can clean a dog without water. There are many alternatives to bathing a dog with a showerhead. You could give your pet a sponge bath, use wet wipes while brushing their fur, or apply a liberal amount of dry shampoo. Your pet’s environment is just as important as their routine, though. Be sure to regularly wash any cushions or blankets that your dog sleeps on. Just because your dog kicks up a stink when it’s time to remove its distinctive aroma, there is no excuse to avoid keeping your canine clean. It will benefit both of you, and it may even help your dog learn to love the idea of being bathed. It’s not likely, but it could happen. 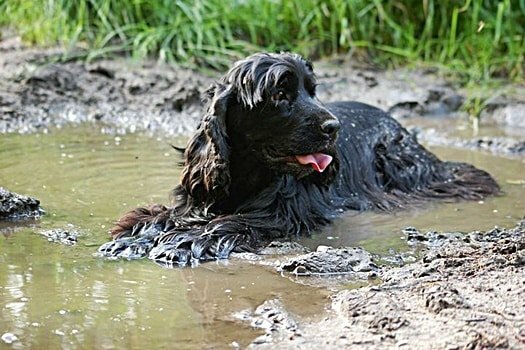 Let’s take a look at the ways that you can keep your dog from getting too smelly and scruffy between bath times. 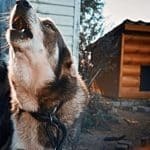 By following these tips, you’ll be able to minimize the impact of a dog’s reluctance to wash.
1 Is My Dog Licking Itself Enough to Keep It Clean? 1.2 Can I Use Human Perfume or Deodorant on My Dog? 1.6 Will My Dog Get Fleas if I Don’t Bathe Them? 1.7 Will My Dog Get Sick if I Don’t Bathe Them? Is My Dog Licking Itself Enough to Keep It Clean? Dogs are naturally clean animals, and even though they tend to roll around in strange-smelling things, they don’t enjoy being dirty. As a result of this desire to be clean, your dog will frequently wash between baths by licking. Unfortunately for Fido, dogs are not as capable of staying spotless with the aid of their saliva in the same way as cats do. Your pooch will do their best to stay clean by licking, especially after using the bathroom, but that’s no substitute for a real wash and groom. Don’t rely on your dog to take care of its cleaning. That’s your job. Well, you’d have a somewhat pungent aroma if you skipped your shower day for several weeks in a row, too. To get rid of that distinct dog smell, you’re going to have to undertake one of the waterless washing techniques that we are set to discuss. The good news is that you can keep your dog clean without the use of the bath, and you’ll even be able to improve their natural aromas. Can I Use Human Perfume or Deodorant on My Dog? If your dog is letting off stink lines everywhere they go, you may be tempted to spray some human perfume or deodorant over their fur, but this should be avoided. Dogs have a different skin pH to humans, and thus they’ll grow irritated by the chemicals and fragrances found in such products. You can pick up specialist canine perfumes from a reputable pet store. This is one of the most unfortunate impacts of failing to wash your dog. If your pet’s paws are starting to smell distinctly like popcorn, the chances are they are exhibiting signs of a yeast infection of the paws. This will be unpleasant for Fido, as it means that they have fungus growing between their toes as a result of sweat steadily building up. Thankfully, such infections are also comparatively easily resolved if you catch them early enough, though water will be involved. You’ll need to dilute some white vinegar and dip your pooch’s paws inside – making sure to rinse the solution off afterward, as your dog is likely to lick their paws. It may also be worth making an appointment with a vet, however, to ensure that the infection does not spread. There are many ways that you can keep your dog clean without washing them in the tub. Regardless of how your pet feels about bathing, it’s vital that you undertake certain practices between wet washes. There is more to grooming your dog than just bathing them periodically. You’ll also need to cut their hair, trim their nails, check and clean their ears, remove any tear stains from around their eyes, brush their teeth – the list of tasks is almost endless. You’ll need to ensure that you brush your dog’s fur at least once a day. Not only will this make your dog happy and help to strengthen your bond, but it will also prevent any tangles from taking hold in their fur and keep them clean as a result. Giving your dog a good, lengthy brush and comb will remove a great many traces of dirt and grime by default and will help you discover anything untoward that needs to be looked at by a vet such as lumps and bumps. Attend to your dog’s fur with a specialist comb or brush. 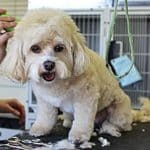 If you feel that your dog needs a trim, do so yourself or book in a professional groomer. Look at your dog’s paws, checking for any sign of infection or extended nails that need clipping. Examine your dog’s teeth and gums, checking for discoloration or bad breath. Give those gnashers a brush if necessary. Take a good look at your dog’s ears and take action at any sign of infection. The occasional clean with a cotton bud is also advisable. Examine your dog’s eyes and clean up any tear stains, while also ensuring that they do not appear to have any foreign objects trapped within them. Ensure that your dog’s private parts are clear so they can eliminate safely and comfortably. Make all of this a habit, and you’ll soon be able to stay on top of your dog’s grooming needs – and you’ll have an innate understanding of when you may have to run a bath for them. If you’re lucky, you might even be able to teach your pet that grooming and washing isn’t something to fear! We understand that you’re reluctant to go through the whole rigmarole of giving your dog a bath, but that doesn’t mean that you can’t rinse them off from time to time. It’s usually the idea of getting their head wet or having water streaming down their face, that upsets a dog most during bath time. There appears to be a Pavlovian reflex that links washing a dog’s head with a shake of their body and a desperate attempt to get out of the tub. If you can get your dog used to being gently rinsed with warm water occasionally – maybe even daily – this will be beneficial. Getting rid of any mud traces on their paws and tummy will go a long way to keeping a dog clean and preventing too many foul stenches. Fill a tub (or kitchen sink if your pooch is small enough) and allow your dog to bask in the water – avoiding the temptation to switch on the shower and apply shampoo. You’ll need to give your pet a proper bath eventually, but this is an excellent way of prolonging the inevitable and preventing infection from gaining hold. When you’re cleaning the house and doing your laundry, don’t neglect the areas that your dog sets up home such as cushions and blankets. Every time your dog goes outside and gets mucky, they return to their favorite spot for a nap – and may well roll and rub themselves all over the area. This can then become an eternal cycle. Your dog will deliberately make their self-proclaimed property smell comforting to them, which will then transfer the aroma to their skin and fur. If you want a clean dog, you’re going to need to keep a clean house. If you are keen to prevent your dog from getting filthy while taking a stroll, you may want to look into dressing them in clothing. Many dogs will reject this out of hand, refusing to wear any garment, while larger canines will also be too big for anything you’ll find in a pet store. Coats and Jumpers are the easiest way of keeping a dog’s tummy and torso clean on a muddy walk – as well as ensuring they don’t get too chilly while strolling either. Socks and Booties will protect your dog’s paws from getting damp or picking up anything unpleasant. These are particularly important during the cold seasons when roads are covered with road salt. If you can play dress-up with your dog, you may want to consider either or both of the above to minimize the chances of your dog getting filthy. Just remember that a pooch is not a doll and if they show any signs of distaste for their clothing remove it. Sponge baths are a potential method of keeping your dog clean and sweet smelling between showers. Fill a sink or tub with warm water and grab a very soft flannel or washcloth. It may also be advisable to visit a pet store and pick up a bar or dog soap – avoid human soaps and shampoos wherever possible. Give your dog a good scrub with the soapy washcloth, saving the head and face for last. You should then rinse off any lingering soap. Then give your towel a thorough towel drying and leave them to air dry. Sponge bathing may not appeal to every dog, but it’s typically a safer bet than splashing your pooch in the shower. It may appeal to an older dog in particular. 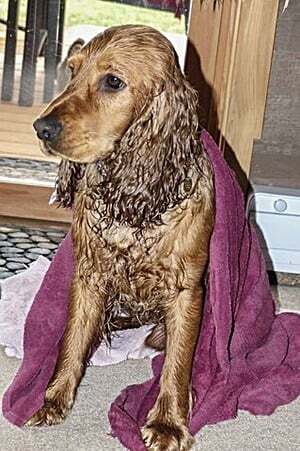 The idea of a waterless dog bath is appealing to many pooch parents. It will usually lead to considerably less fuss, save on laundry as it will prevent your clothes from being soaked, and it should even spare your carpets wet and damp paw prints. Arguably the simplest way of keeping a dog without water is the wet wipe. These products are a great way of staying on top of any daily dirt, dust, and grime that may attach itself to your dog’s fur, but as always there are certain precautions that you will need to take. Wherever possible, use a dog-specific brand of wet wipe from a pet store. These items will have been specially designed to appeal to the delicate acid-alkaline balance of a canine’s skin and not irritate them. If you decide to buy human wet wipes, you should make sure it’s designed for babies, as these will be soft and delicate on your dog’s skin. This baby rule can be applied to any human product that you plan on using on your dog, whether it’s wet wipes, shampoo or suntan lotion. If your dog has an infection on their skin or paws, consider the use of a specialist antibacterial wipe. It’s always worth discussing this with a vet beforehand though, in case your pet is likely to have any other skin sensitivity. Dry dog shampoo is essential canned foam that you spray all over your dog’s fur while you are waiting for their next scheduled bath time. The contents of the can will absorb all the oils from your canine’s fur and leave it healthy and shiny while keeping the fur from growing too greasy or starting to smell. Opinion is split on how effective dry shampoo is, with Dogs Naturally Magazine keen to remind us that a little natural oil is a good thing, but the product is mostly considered to be safe for use on the typical hound. The idea of dry dog shampoo is that it’s an entirely water-free wash for your pet, so obviously you’ll have to make sure that you can pick up a brand that does not require rinsing afterward. If your dog has any skin allergies or sensitivities that will also need to be taken into consideration. Read the ingredients of a dry shampoo every bit as carefully as you would those of a traditional equivalent that you’d wash out after use. You’ll find plenty of these products online or in your local pet store – or you could mix your own that is tailored to your dog’s personal preferences in scent and sensation. If you are keen to take a DIY approach to cleaning your dog without water, you can make a dry shampoo using a variety of ingredients available in any high street. Mix up half a cup of cornstarch, half a cup of baking soda and up to five drops of Lavender essential oil into a bowl. Pour this into a receptacle that can be used to apply to your dog – an empty salt shaker, for example, or a jar that has holes pricked into the lid. Give your dog a thorough brush, then shake the dry shampoo over their fur. 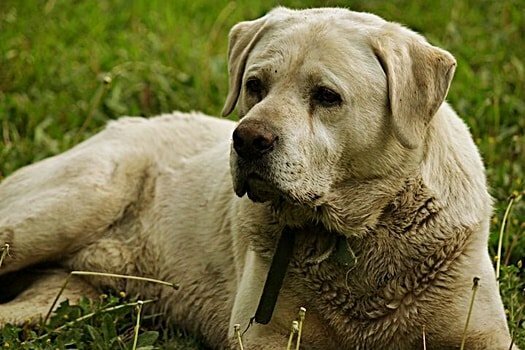 Rub the shampoo solution all over your dog’s coat. Get in there with this, and leave the solution for a minute or two. Give your dog another brush. 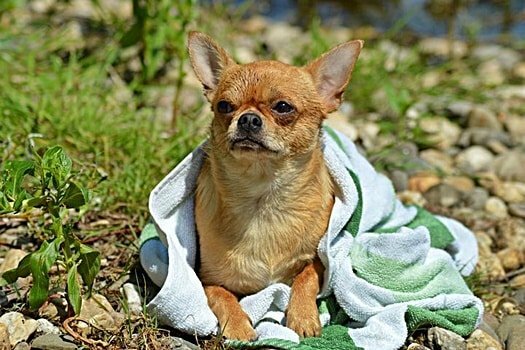 Grab an old towel that you don’t mind getting dirty and brush your dog off. That’s it! If your dog does not like the scent of lavender or has a sensitivity to the product, there is a considerably more basic – though less impactful – alternative DIY dry shampoo. Coat your dog in baking soda, then brush it out. You may want to keep the vacuum handy to clean up the mess after! If your dog can tolerate being sprayed with a product, you can concoct something even more potent. Combine three tablespoons of baking soda with a teaspoon of dish liquid and a teaspoon of gentle baby oil, and spritz that all over their coat. They’ll be a little wet after and will need to dry off, but this can be a useful method of keeping Fido’s fur fresh, as well as combatting any potential flea infestation. Will My Dog Get Fleas if I Don’t Bathe Them? Unlike the human version of lice, which only like to set up a nest in clean hair, fleas are not picky about the condition of their canine host’s fur. A dog that is not bathed is potentially more likely than a clean counterpart to suffer a flea infestation – though obviously, any dog that is not treated with a preventative medication will be at risk. The fact remains though, if you are not washing – or, at the very least, cleaning and examining – your dog with any regularity, their bodies may well become a breeding ground for parasites. Make regular checks for fleas, especially if your dog is scratching more then usual. Will My Dog Get Sick if I Don’t Bathe Them? This depends on how you define ‘sick.’ A dog will be at risk of yeast infections if they are not cleaned regularly, though that does not necessarily revolve around bathing. However, dry skin in dogs is a very real concern if your pet does not receive enough moisture to their flesh. At the very least, ensure that you’re giving your pet a once-over with wet wipes and apply some oils to keep their tummy from drying out. Coconut oil and shea butter are particularly impactful for this purpose. Washing a dog is often the lowlight of a pooch parent’s month, but it doesn’t need to be this way. By following the advice that we have laid out in this article, you’ll be able to keep on top of your dog’s cleaning regime over a prolonged period of time, ensuring that the shower or bath does not need to be too intense. You may even be able to put the experience off for up to three months, although that is not necessarily advisable! Only you know the best regime for washing your dog, and whether you are best served to do it yourself or by booking in a regular appointment with a professional groomer. Regardless of what you decide, you still have a responsibility to your dog to keep them fresh and clean between baths. It may not seem like it at the time, but your dog will be grateful for your efforts – and so will any guests to your home. Remember, just because you no longer notice the smell that your canine gives off as it has become a daily feature in your life, it doesn’t mean that nobody else will.